Blair Farthing is a Producer for CTV Morning Live, and the Anchor of the CTV Prince Albert News at Noon. Blair was born and raised in the Parkridge neighborhood of Saskatoon. After graduating from ED Feehan High School he moved to Lethbridge, where he graduated with honors in the Broadcast program at Lethbridge College. He started at CTV Saskatoon in 2010, serving as an ENG/Camera Operator before he moved to CTV Prince Albert to become a Video Journalist and Anchor. 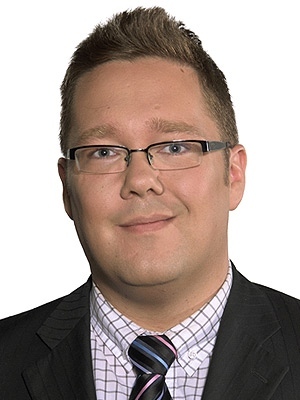 Blair recently returned to CTV Saskatoon, and serves as a Producer for CTV Morning Live, while filling in as a reporter, anchor, or any other role he's needed in. Outside of work Blair enjoys spending time with his wife and family and getting into shenanigans with his best friend Mike Ciona. Blair loves baseball and football (he usually wins the fantasy football league with the CTV crew) and has an uncanny ability to quote the movie Mean Girls.